Background: The Thai Study of Affective Disorders was a tertiary hospital-based cohort study developed to identify treatment outcomes among depressed patients and the variables involved. In this study, we examined the baseline characteristics of these depressed patients. Methods: Patients were investigated at eleven psychiatric outpatient clinics at tertiary hospitals for the presence of unipolar depressive disorders, as diagnosed by the Diagnostic and Statistical Manual of Mental Disorders, Fourth Edition. The severity of any depression found was measured using the Clinical Global Impression and 17-item Hamilton Depression Rating Scale (HAMD) clinician-rated tools, with the Thai Depression Inventory (a self-rated instrument) administered alongside them. Sociodemographic and psychosocial variables were collected, and quality of life was also captured using the health-related quality of life (SF-36v2), EuroQoL (EQ-5D), and visual analog scale (EQ VAS) tools. Results: A total of 371 outpatients suffering new or recurrent episodes were recruited. The mean age of the group was 45.7±15.9 (range 18–83) years, and 75% of the group was female. In terms of diagnosis, 88% had major depressive disorder, 12% had dysthymic disorder, and 50% had a combination of both major depressive disorder and dysthymic disorder. The mean (standard deviation) scores for the HAMD, Clinical Global Impression, and Thai Depression Inventory were 24.2±6.4, 4.47±1.1, and 51.51±0.2, respectively. Sixty-two percent had suicidal tendencies, while 11% had a family history of depression. Of the major depressive disorder cases, 61% had experienced a first episode. The SF-36v2 component scores ranged from 25 to 56, while the mean (standard deviation) of the EQ-5D was 0.50±0.22 and that of the EQ VAS was 53.79±21.3. Conclusion: This study provides an overview of the sociodemographic and psychosocial characteristics of patients with new or recurrent episodes of unipolar depressive disorders. To examine these associated factors and outcomes, we carried out the Thai Study of Affective Disorder (Thai-SAD), a one-year observational, collaborative, prospective cohort study of treatment outcomes in patients with MDD and/or dysthymic disorder, as well as patient quality of life. The research consisted of a multicenter study carried out at psychiatric outpatient clinics at tertiary hospitals (university and provincial hospitals) throughout Thailand, using newly diagnosed or referred cases from community hospitals and primary care settings. The purpose of this paper is to present the baseline sociodemographic and psychosocial characteristics of the study participants. A prospective, longitudinal follow-up study was carried out over the period March 2011 to August 2012 in 346 enrolled outpatients diagnosed with MDD, dysthymic disorder, or double depressive disorder, who were receiving standard treatment from a multidisciplinary team of psychiatrists, psychologists, and social workers at eleven tertiary hospitals across Thailand. The study period lasted one year at each of the sites, although the whole study took 17 months due to the varying start times. Eligible participants were aged 18 years or older, had presented with symptoms to an outpatient clinic, and had then screened positive for depression when using the two-question (depressed mood and/or loss of interest) screening questionnaire, had experienced a first episode of MDD or recurrent episodes, and/or recurrent episodes of dysthymia or double depression. Exclusion criteria were: comorbidity, pregnancy, and lactation; severe substance abuse; cognitive impairment on Mini-Mental Status Examination; a history of schizophrenia or bipolar disorder; and failure to provide written informed consent. At baseline, the participants were diagnosed as having MDD and/or dysthymic disorder according to the Diagnostic and Statistical Manual of Mental Disorders, Fourth Edition, Text Revision (DSM-IV-TR) using the Mini International Neuropsychiatric Inventory (MINI),22,23 and were also assessed for depression by trained clinicians and psychiatric investigators. Demographic data and psychosocial variables, as reported by the participants, were then collected by research assistants. The participants were followed up at 3-month intervals over a one-year period (five assessments, including baseline). The 17-item Hamilton Depression Rating Scale (HAMD-17) and Clinical Global Impression (CGI) were evaluated by investigators at each visit; however, a complete set of measurements (all using clinician-rated and self-reporting questionnaires) was carried out three times; first at baseline, the second time at visit 3, and the third time at visit 5. Of the 3,167 outpatients being treated for MDD across all eleven hospitals at the time of the study, 371 (11.7%) cases with a new episode or recurrent episodes of unipolar MDD, dysthymic disorder, and/or double depression gave their consent and were recruited. Twenty-five of these potential participants were excluded due to the presence of comorbidity, meaning the final study included 346 patients. For the continuous variables, the mean ± standard deviations (SD) and median with range were used, whereas categorical data were presented as the number and percentage. The statistical significance level for all the tests was set at a P-value <0.05, and Statistical Package for the Social Sciences version 17 software (SPSS Inc., Chicago, IL, USA) was used to perform all the analyses. Table 1 shows that the mean ± SD participant age was 45.7±15.9 (range 18–83) years. Seventy-five percent of respondents were female, and 42 (12.1%) had been educated to elementary school level or less. In terms of marital status, 109 (32.3%) were single, while for employment status, most were employed (75.7%). Two hundred and four (62.2%) earned no more than 10,000 baht (US$300) per month, while 39.9% earned less than 5,000 baht (US$166.7). Two hundred and twenty-six (79.4%) had government-related health insurance. Abbreviations: CGI-S, Clinical Global Impression of Severity; MDD, major depressive disorder; SD, standard deviation; HAMD-17, 17-item Hamilton Depression Rating Scale. With respect to the diagnoses, MDD was diagnosed in 88.4% of the sample, with 61.4% having a first episode of MDD. Nearly 12% of the group was suffering from dysthymic disorder, while nearly 50% had superimposed MDD (double depression). The mean ± SD scores on the HAMD for MDD, dysthymic disorder, and double depression were 24.20±6.4, 19.90±6.4, and 25.06±4.6, respectively. The mean ± SD CGI score was 4.47±1.1. There was a high incidence of suicidality found in 207 of the group (62.3%), with 51.7% suffering a moderate to severe level. Eighty respondents (26.5%) had a history of suicide attempts, whereas 29.2% had a family history of a psychiatric disorder. Among those with a family history of a psychiatric disorder, a history of depression was prevalent (10.7%). In terms of psychosocial factors, the mean ± SD for the 32-item Inventory of Interpersonal Problems scale, attachment anxiety, attachment avoidance, PSS, and MSPSS was 65.8±13.3, 3.72±1.6, 3.88±1.1, 19.22±5.3, and 4.38±1.3, respectively. The percentage of those demonstrating secure attachment was higher than for insecure attachment (80.6% versus 19.4%). For quality of life, the subscale scores using the SF-36v2 ranged from 25.35 to 55.60. The subscale for general health received the lowest score (25.35±18.20), while physical role received the highest score (55.60±28.3). The mean score generated by the EQ-5D tool for the total sample was 0.502±0.22, and this corresponded with the mean score produced by the EQ VAS, which was 50.86±21.5, reflecting a moderate quality of life score (Table 2). Abbreviations: EQ-5D, EuroQoL-5 Dimension descriptive system; EQ VAS, EuroQoL visual analog scale; SD, standard deviation; SF-36v2, 36-item health-related quality of life tool. As found in other studies, women sought treatment for depression more readily than men. For example, in a Canadian and US national survey, the ratio of females to males seeking treatment was 1.64–1.67:1, which is consistent with a previous national survey in Thailand where the ratio was 1.6:1.2,34,35 However, for our study, carried out in a university or provincial hospital setting, this ratio rose to 2.97:1, when hospitals are considered tertiary care settings where patients can access treatment either directly or via referral. This figure is similar to that reported for South Korea by Kim et al, who found a ratio of 2.91:1.36 This may be due to the fact that depressed Asian men are less likely to seek help than depressed Asian women.37–39 In addition, when comparing our age group results with those in that study, we found a similarly high proportion of elderly patients, ie, 18.8% (14.5% over 65 years of age) as compared with 16.7% (aged 65 years and over) in South Korea. The ratio found for this age group was, therefore, higher in this study than in previous Thai studies. In terms of the distribution of diagnoses, the rate of dysthymia in our study was quite low when compared with other studies, even though it was found to be higher than in the national survey (11.5% versus 8.8% in the national survey),2 which may be due to the poor validity of the Thai MINI instrument with regard to diagnosis of dysthymia (Cohen’s kappa only 0.2).23 In terms of future research, another instrument, such as the Structured Clinical Interview for DSM-IV Axis I Disorders dysthymia module, may be added to the MINI to ensure a better dysthymia diagnosis. With respect to past history of suicide attempts, our study produced similar results to those of the South Korean study (26% versus 21%, respectively),36 both of which are higher scores than those recorded by Claassen et al in the USA (16.5%).40 The rate of recurrent suicidality episodes was found to be higher in our study than in the 2008 national survey in Thailand,2 which was carried out in a primary care setting (and for which the results were 2.4% for the current rate and 0.7% for the recurrent rate).2 This may have been because our research settings were university hospitals, to which patients are often referred from primary care or secondary care hospitals. In addition, the impact of a family history of depression was found to be similar to that in the study by Kim et al (10% versus 13.8%, respectively), but dissimilar to the Western research undertaken by Nierenberg et al (55.6%)41 and Yang et al (25%–33%).42 It is difficult to draw definitive conclusions from these results; however, we speculate that this discrepancy may reflect the questionnaire used. Family history in the Thai-SAD was assessed using a single question and noncategorized subjects (parents or parents of first-degree family members), which may have limited the reliability of the data when compared with the studies by Nierenberg et al and Yang et al. 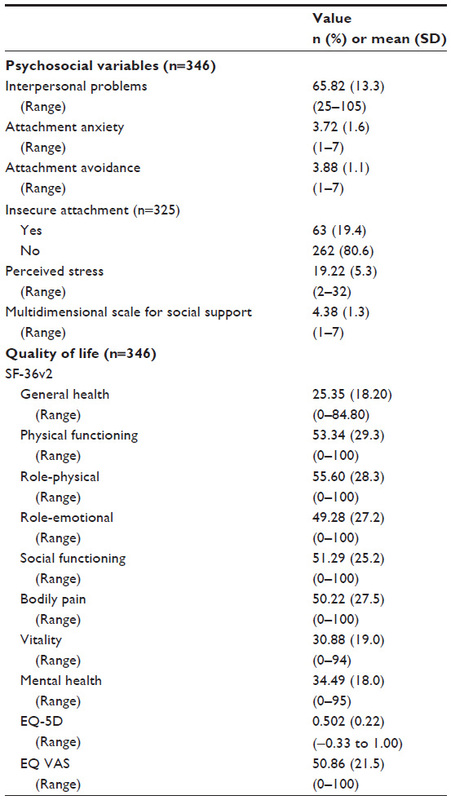 When using the EQ-5D tool, depressed patients were found to have an overall moderate quality of life score, which is consistent with the results obtained using the EQ VAS and SF-36v2. It is important to note that quality of life in this Thai sample was found to be lower among depressed patients than in other studies.45,46 Further research is needed in order to examine this finding in more detail. Our study has some strengths, in that it was a multicenter study of a “real-life” cohort of depressed patients and all sociodemographic, clinical, and psychosocial variables were assessed. However, the study also has some limitations. First, its design meant that there were inevitable problems related to missing data. Second, there are no standard treatment guidelines available for depression in Thailand, plus antidepressant drugs used at sites are different, depending on the health care delivery system provided of each site. This limits the level of homogeneity in terms of the practice guidelines used. Thai-SAD provides sociodemographic and psychosocial data for a group of Thais experiencing new or recurrent episodes of unipolar depression. The unique aspect of this study is that it collected data regarding psychosocial variables, which may act as predictors for recurrence or relapse of depression. Some psychosocial variables, eg, a high perception of stress score, may predict a relapse. Firm conclusions cannot be reached as yet; however, because the complete data set is not yet available, the data here represents a baseline. Our intention is to address this shortfall in a subsequent study. This study was funded by the National Research Council of Thailand (NRCT), and was coordinated and supported by the Medical Research Network of the Consortium of Thai Medical School (MedResNet). Additional funding for the research was provided by the Faculty of Medicine, Chiang Mai University. Bundhamcharoen K, Odton P, Phulkerd S, Tangcharoensathien V. Burden of disease in Thailand: changes in health gap between 1999 and 2004. BMC Public Health. 2011;11:53. Kongsuk T. The prevalence of major depressive disorders in Thailand: results from the Epidemiology of Mental Disorders National Survey 2008. Available from: http://www.dmh.go.th/downloadportal/Morbidity/Depress2551.pdf. Accessed June 13, 2013. Shaver PR, Schachner DA, Mikulincer M. Attachment style, excessive reassurance seeking, relationship processes, and depression. Pers Soc Psychol Bull. 2005;31(3):343–359. Conradi HJ, de Jonge P. Recurrent depression and the role of adult attachment: a prospective and a retrospective study. J Affect Disord. 2009;116(1–2):93–99. Wongpakaran N, Wongpakaran T, van Reekum R. Social inhibition as a mediator of neuroticism and depression in the elderly. BMC Geriatr. 2012;12(1):41. Denollet J. Depression, anxiety, and trait negative affect as predictors of cardiac events: ten years after. Psychosom Med. 2008;70(8):949–951. Candrian M, Schwartz F, Farabaugh A, Perlis RH, Ehlert U, Fava M. Personality disorders and perceived stress in major depressive disorder. Psychiatry Res. 2008;160(2):184–191. Karaçam Z, Ançel G. Depression, anxiety and influencing factors in pregnancy: a study in a Turkish population. Midwifery. 2009;25(4):344–356. Baker D, Taylor H. The relationship between condition-specific morbidity, social support and material deprivation in pregnancy and early motherhood. ALSPAC Survey Team. Avon Longitudinal Study of Pregnancy and Childhood. Soc Sci Med. 1997;45(9):1325–1336. Ross LE, Sellers EM, Gilbert Evans SE, Romach MK. Mood changes during pregnancy and the postpartum period: development of a biopsychosocial model. Acta Psychiatr Scand. 2004;109(6):457–466. Webster J, Linnane JW, Dibley LM, Hinson JK, Starrenburg SE, Roberts JA. Measuring social support in pregnancy: can it be simple and meaningful? Birth. 2000;27(2):97–101. Mckee MD, Cunningham M, Jankowski KR, Zayas L. Health-related functional status in pregnancy: relationship to depression and social support in a multi-ethnic population. Obstet Gynecol. 2001;97(6):988–993. Dysvik E, Lindstrøm TC, Eikeland OJ, Natvig GK. Health-related quality of life and pain beliefs among people suffering from chronic pain. Pain Manag Nurs. 2004;5(2):66–74. Han K, Lee P, Lee S, Park E. Factors influencing quality of life in people with chronic illness in Korea. J Nurs Scholarsh. 2003;35(2):139–144. Arkar H, Sari O, Fidaner H. Relationships between quality of life, perceived social support, social network, and loneliness in a Turkish sample. Yeni Symposium. 2004;42(1):20–27. Avicenna M, Abdul Rahman WR. The correlation of health related quality of life with psychological distress, social support and cognitive coping in chronic pain patients. Paper presented at the 4th International Postgraduate Research Colloquium- IPRC2007. International Journal of Behavioral Science. 2008;3(1):31–44. Klein DN, Schwartz JE, Rose S, Leader JB. Five-year course and outcome of dysthymic disorder: a prospective, naturalistic follow-up study. Am J Psychiatry. 2000;157(6):931–939. Goldney RD, Fisher LJ. Double depression in an Australian population. Soc Psychiatry Psychiatr Epidemiol. 2004;39(11):921–926. Rhebergen D, Beekman AT, Graaf R, et al. The three-year naturalistic course of major depressive disorder, dysthymic disorder and double depression. J Affect Disord. 2009;115(3):450–459. Kongsakon R, Udomsubpayakul U, Buranapichet U, Presertchai R. Clinical response of depressive patients in a Thai psychiatric care setting. J Med Assoc Thai. 2005;88(8):1110–1114. Angermeyer MC, Holzinger A, Matschinger H, Stengler-Wenzke K. Depression and quality of life: results of a follow-up study. Int J Soc Psychiatry. 2002;48(3):189–199. Sheehan D, Lecrubier Y, Sheehan K, et al. The Mini-International Neuropsychiatric Interview (MINI): the development and validation of a structured diagnostic psychiatric interview for DSM-IV and ICD-10. J Clin Psychiatry. 1998;59 Suppl 20:22–33. Kittirattanapaiboon P, Khamwongpin M. The validity of the Mini International Neuropsychiatric Interview (MINI)- Thai version. J Ment Health Thai. 2005;13(3):126–136. Lotrakul M, Sukkhanit P, Sukying C. The development of Hamilton Rating Scale for Depression – Thai version. J Psychiatr Assoc Thai. 1996;41:235–246. Lotrakul M, Sukanich P. Development of the Thai Depression Inventory. J Med Assoc Thai. 1999;82(12):1200–1207. (Thailand) TTBF. Thai Geriatric Depression Scale. Siriraj Hosp Gaz. 1994;46:1–9. EuroQol Group. A new facility for the measurement of health-related quality of life. Health Policy. 1990;16(3):199–208. Tongsiri S, Cairns J. Estimating population-based values for EQ-5D health states in Thailand. Value Health. 2011;14(8):1142–1145. Wongpakaran T, Wongpakaran N, Sirithepthawee U, et al. Interpersonal problems among psychiatric outpatients and non-clinical samples. Singapore Med J. 2012;53(7):481–487. Wongpakaran T, Wongpakaran N. A short version of the revised ‘experience of close relationships questionnaire’: investigating non-clinical and clinical samples. Clin Pract Epidemiol Ment Health. 2012;8:36–42. Wongpakaran N, Wongpakaran T. The Thai version of the PSS-10: an investigation of its psychometric properties. Biopsychosoc Med. 2010;4:6. Wongpakaran T, Wongpakaran N, Ruktrakul R. Reliability and validity of the Multidimensional Scale of Perceived Social Support (MSPSS): Thai version. Clin Pract Epidemiol Ment Health. 2011;7:161–166. Wongpakaran N, Wongpakaran T. A revised Thai multi-dimensional scale of perceived social support. Span J Psychol. 2012;15(3):1503–1509. Silverstein B. Gender differences in the prevalence of somatic versus pure depression: a replication. Am J Psychiatry. 2002;159(6):1051–1052. Romans SE, Tyas J, Cohen MM, Silverstone T. Gender differences in the symptoms of major depressive disorder. J Nerv Ment Dis. 2007;195(11):905–911. Kim TS, Jeong SH, Kim JB, et al. The clinical research center for depression study: baseline characteristics of a Korean long-term hospital-based observational collaborative prospective cohort study. Psychiatry Investig. 2011;8(1):1–8. Jang Y, Kim G, Chiriboga DA. Gender differences in depressive symptoms among older Korean American immigrants. Soc Work Public Health. 2011;26(1):96–109. Kornstein SG, Schatzberg AF, Thase ME, et al. Gender differences in chronic major and double depression. J Affect Disord. 2000; 60(1):1–11. Lin HW, Hsu HC, Chang MC. Gender differences in the association between stress trajectories and depressive symptoms among middle aged and older adults in Taiwan. J Women Aging. 2011;23(3):233–245. Claassen CA, Trivedi MH, Rush AJ, et al. Clinical differences among depressed patients with and without a history of suicide attempts: findings from the STAR*D trial. J Affect Disord. 2007;97(1–3):77–84. Nierenberg AA, Trivedi MH, Fava M, et al. Family history of mood disorder and characteristics of major depressive disorder: a STAR*D (sequenced treatment alternatives to relieve depression) study. J Psychiatr Res. 2007;41(3–4):214–221. Yang F, Li Y, Xie D, et al. Age at onset of major depressive disorder in Han Chinese women: relationship with clinical features and family history. J Affect Disord. 2011;135(1–3):89–94. Wongpakaran T, Wongpakaran N. How the interpersonal and attachment styles of therapists impact upon the therapeutic alliance and therapeutic outcomes. J Med Assoc Thai. 2012;95(12):1583–1592. Gerhards SA, Evers SM, Sabel PW, Huibers MJ. Discrepancy in rating health-related quality of life of depression between patient and general population. Qual Life Res. 2011;20(2):273–279. Lai CH. Major depressive disorder: gender differences in symptoms, life quality, and sexual function. J Clin Psychopharmacol. 2011;31(1):39–44. Jonkers CC, Lamers F, Evers SM, Bosma H, Metsemakers JF, Van Eijk JT. Economic evaluation of a minimal psychological intervention in chronically ill elderly patients with minor or mild to moderate depression: a randomized trial (the DELTA-study). Int J Technol Assess Health Care. 2009;25(4):497–504.